Satellite Image. Oh, say, can you sea? Close-up of the NASA Blue Marble full-earth image to show the Mediterranean Sea. Crete is in the center. 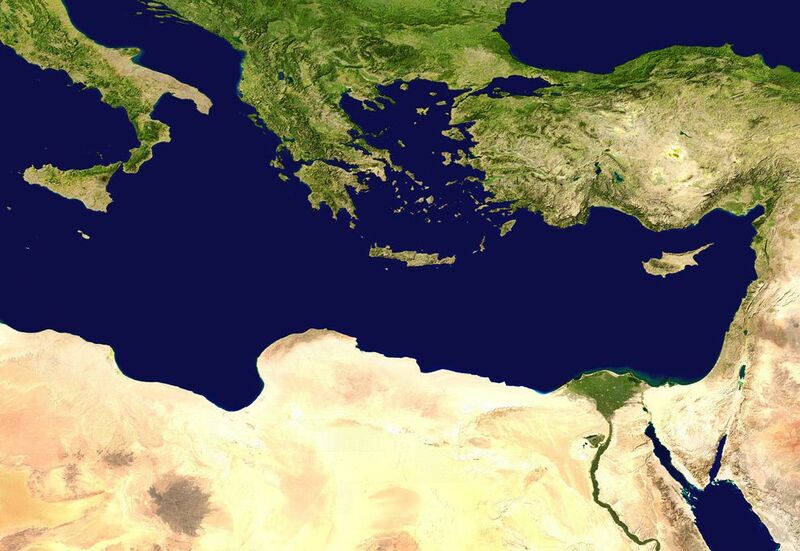 This is a satellite image of the eastern Mediterranean Sea. Find the Mediterranean Sea, and use the topographic map mode of the MapMaker Interactive to answer questions in the next tab. What seas are visible in this image? Four smaller seas are part of the northern Mediterranean: the Tirreno (Tyrrhenian) Sea, the Adriatic Sea, the Ionian Sea, and the Aegean Sea. The Sea of Marmara links the Black and Aegean Seas. The tiny, landlocked Dead Sea (bet you forgot about this one!) is visible above the Red Sea in the lower right of the image. What are the three largest islands in this image? The three largest islands in the eastern Mediterranean are, from left to right: Sicily, Italy; Crete, Greece; and Cyprus. Sicily straddles the Tyrrhenian and Mediterranean Seas. Crete borders the Mediterranean and Aegean. Cyprus is in the far eastern Mediterranean. Where is the largest group of islands in this image? The Aegean Sea is dotted with hundreds of tiny islands, most of them a part of the nations of Greece and Turkey. What continents are visible in this image? Europe, in the north of this image, borders the Mediterranean and Black Seas. Asia, to the east, borders all three major seas. Africa, to the south, borders the Red and Mediterranean Seas. Of the three major seas (Mediterranean, Black, and Red), which do you think has the lowest salinity? The Black Sea has the lowest salinity. In fact, during the last ice age, the Black Sea was probably a large, mostly-freshwater lake.